Ten Things a Pastor Should Do: #5- Exercise three times a week. 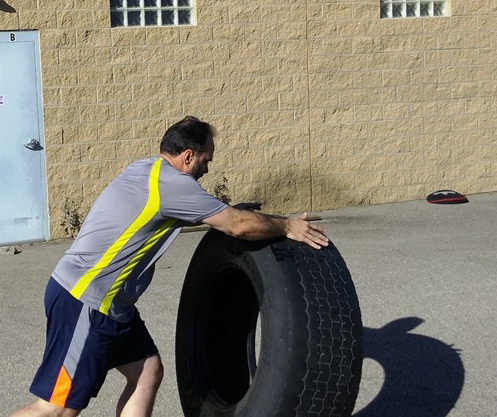 Over 18 months ago, my wife found a Groupon deal for this crazy sounding idea- we could go to a thing called “Boot Camp” and pay only $35 for twenty sessions. When she told me about it, my ears perked up- it was cheap, yes, but it sounded, well scary. Memories of my young adulthood and Army basic training immediately sprang up: frightening men in brown hats with deep yet shrill voices growling in my face as I “pushed the earth” countless times all day, every day. Reluctantly, I told her that I would do it and we bought the Groupon deal for the two of us. A short time later we did our first Boot Camp. I looked around and saw no big, ugly drill sergeants, no brown hats, no yelling, not even intimidation. Nope, none of that. I saw instead support, encouragement, and even (gulp!) smiles on the faces of the trainers. The one hour session was rough (real rough) but the supportive atmosphere helped me to want to come back. 18 months later, I am still going to Boot Camp. My Groupon deal has long since been used up, and I have gladly paid the regular price for exercising at T3 Fitness. While my wife also enjoyed her experience there, my son has grabbed on to it most of all, being greatly been changed in losing 62+ pounds and counting! It is true that we should all stay in shape, but for pastors who often care about other areas of their lives but neglect the physical, exercise should be a priority. In 3 John 2, the Apostle John encouraged his readers when he wrote, “I pray that all may go well with you and that you may be in good health, as it goes well with your soul.” Paul wrote to “glorify God in your body” (1 Cor 6:20). Many a pastor (this guy included) has spent hours of sitting, studying, visiting, and inactivity. Oftentimes, meals are quickly gulped down in the car while heading to another appointment. This lifestyle is obviously stressful, but add to this routine a lack of a dedicated time of exercise and disaster is bound to happen. I’m not quite there yet, but I’m a work in progress. However, let me ask: How are you exercising on a regular basis? What has worked for you?